Storm Desmond reigned havoc across the United Kingdom and Ireland this weekend. One of the most poignant images of its scale comes from Carlisle, where it left hundreds of homes flooded. 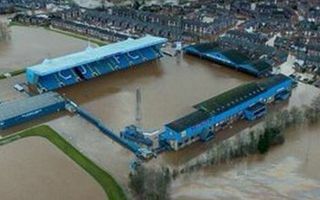 And also covered in water is Brunton Park, the stadium flooded on a couple occasions already, recently in November. Carlisle United weren’t playing at home this weekend, but today the team won an away fixture (vs. Welling, 5:0). During their journey back home, CUFC players announced they will volunteer to help affected residents of the area in the coming days. Team captain Danny Grainger added: "Anyone affected by the Cumbria floods and needing help with anything at all please get in touch and some of the squad can come and help."